The Cayman Islands is a British Overseas Territory located in the western Caribbean. The jurisdiction is recognised as a major international financial centre with leadership in a number of areas, including the offshore trust industry. Private and institutional users are attracted to the Cayman Islands because of its network of top qualified global advisers, professional and efficient infrastructure, business-friendly approach, adaptability, English common-law framework, economic and political stability, effective regulation and tax neutrality. The law in the Cayman Islands is derived from an amalgamation of common law and equity, English statutes and local statutes. Trust legislation is supported by a strong and highly regarded local and independent judiciary, court system and legal community. Public and private sectors are continuously reviewing and updating key legislation so that it remains current, viable and relevant in a global context, and also creating new legislation to meet ongoing needs. In addition to traditional private wealth planning, Cayman Islands trusts and companies are used extensively in corporate structuring, capital markets transactions and structured finance deals. The Special Trusts Alternative Regime (STAR) developed in 1997, created an innovative trust-planning opportunity, providing for trusts to be established for any purpose, provided it is lawful and not against public policy. Advocates of STAR continue to find new uses for this regime in their planning. The Banks and Trust Companies Law (2013 Revision) and the Private Trust Companies Regulations (2013 Revision) give the Cayman Islands Monetary Authority (CIMA) the responsibility of regulating the trust industry in the Cayman Islands. This includes licensing, registration and ongoing supervision and is a critical feature in the context of a continued focus on compliance in the finance world. CIMA strives to remain first-in-class through ongoing investment in top-quality staff and education and through its collaboration with the private sector in understanding how to meet the needs of Cayman Islands products while upholding the swiftly increasing global standard required of proper regulation. The Cayman Islands continues to play a leading role in the fight against illegal activities and tax evasion to maintain its position as a premier global financial centre. The jurisdiction takes pride in its forward-thinking, cooperative and dynamic attitude, which saw it counted as one of the first countries (referred to as the 'Early Adopter Group') that have implemented the automatic exchange of information exchanges under the Common Reporting Standard (CRS) by September 2017 and leads the way with a comprehensive and sophisticated approach to other global transparency measures. The Cayman Islands is a tax-neutral jurisdiction. There has never been direct taxation in the Cayman Islands either on individuals or corporations and the only fiscal impositions are stamp duty and import duty. The Cayman Islands has no corporation tax, income tax, capital gains tax, inheritance tax, gift tax, wealth tax or any other direct tax. An exempted company, one whose objects are to be carried out mainly outside the Cayman Islands, can be granted a renewable 20-year guarantee that it will not be subjected to taxation. This is an additional comfort for users of the jurisdiction, even though there are presently no taxes in the Cayman Islands. A trust can also be registered as an 'exempted trust' and obtain an undertaking that exempts the trust from the risk of future taxation for 50 years. The Cayman Islands adopts the concept of freedom of testamentary disposition. This sets it apart from most civil law jurisdictions where there are forced heirship rules. In the Cayman Islands, there is no obligation on death to provide for any specified persons and no obligation to maintain dependants. The Cayman Islands is also bound by the conflict of laws rules in England. Under conflict of laws rules, immovable property in an estate will be determined by the laws of the country in which the immovable property is located. Therefore, the Cayman Islands succession law will apply to any immovable property located in the Cayman Islands. Conflict of laws rules further provide that succession of movable property is governed by the law of the deceased's last domicile. Therefore, where a foreign-domiciled person leaves a will disposing of movable property located in the Cayman Islands, the will is only valid to the extent that it is valid under the laws of the deceased's last domicile. It is the responsibility of the deceased's personal representatives to ensure that the estate is dealt with in accordance with the law. The personal representative will apply to the Civil Registry Probate Section of the Grand Court Registry in the Cayman Islands for a grant of representation that serves as proof that the person named within is entitled to collect and distribute the estate. A grant of probate is issued where a will is left by the deceased and the will is proven to the satisfaction of a judge to be valid. A grant of letters of administration will be issued by a judge where no valid will has been left. Foreign grants of representation from foreign courts in respect of the estates of persons who died domiciled outside the Cayman Islands, leaving assets or property within the Islands, can be resealed by the Grand Court in the Cayman Islands. Once resealed, the grant will be valid under Cayman Islands law. Generally, this process is not available where the deceased dies domiciled in a civil law country as grants of probate are unique to common law. Applications for a grant of representation must be made within six months of the date of death of the deceased. In the event of failure to do so, leave of the Court must be obtained before an application can be made. Where the assets of the deceased are held within a Cayman Islands trust structure, it is unusual for a grant of representation to be required in the Cayman Islands to access those assets. This is one of the significant benefits of using a Cayman Islands trust to own Cayman Islands-situated assets. In addition, a Cayman Islands trust can help to ensure that the Cayman Islands-situated assets can be dealt with according to the wishes of the settlor, rather than according to forced heirship rules of other jurisdictions. Cayman Islands trusts frequently form an important part of a family's wealth planning for many reasons. For example, they can be used to preserve capital while providing an income stream for current and future generations, or they can be established to ensure that the family wealth is professionally managed and protected for its intended purpose beyond the lifetime of the current generation. Trusts may also be established to avoid the inconvenience and publicity of probate, or perhaps to create certainty as to the devolution of assets on death where forced heirship laws might otherwise be argued to apply. Depending on the particular circumstances, there can be advantages in setting up trusts in a jurisdiction like the Cayman Islands that has developed a specialised industry. Trusts established under Cayman Islands law adopt the common law concepts of a trust, whereby a trustee (the legal owner of the assets under a trust) holds the assets beneficially for the beneficiaries of the trust in accordance with the terms of the trust instrument. Indeed, a Cayman Islands trust does not have a separate legal personality. As mentioned previously, the law of trusts in the Cayman Islands is primarily grounded in the rules of common law and supplemented by local statues, including the Trusts Law (2017 Revision). The Trust Law is the main source of legislation governing the creation and administration of trusts in the Cayman Islands, while CIMA regulates the services provided by trust companies. The Hague Convention on the Law Applicable to Trusts and on their Recognition 1985 (the Hague Trusts Convention) has not been extended to the Cayman Islands. However, there is nothing in local legislation that would prevent most types of internationally accepted trusts as being recognised in the Cayman Islands. a power to restrict the exercise of any powers of the trustee by requiring that they shall only be exercisable with the consent of the settlor or any other person specified in the trust instrument. Many other jurisdictions have subsequently introduced similar forms of restricted powers legislation. The Cayman Islands created a special type of trust, commonly known as a STAR trust, enacted by the Special Trusts (Alternative Regime) Law 1997 (STAR Law) and is now consolidated with, and contained in, the Trust Law. The intent of the STAR Law was to create an alternative regime under which a new trust, whether for purposes or persons or both, could be created. To create a valid STAR trust, the trust instrument must include a declaration that the STAR Law provisions apply. In addition, at least one of the trustees of a STAR trust must be a trust company licensed in the Cayman Islands. The objects of a STAR trust may be persons or purposes: the persons may be of any number and the purposes may be of any number or kind, charitable or non-charitable, provided they are lawful and not contrary to public policy. This differentiates from the position in other jurisdictions, where it must be decided whether a trust is a purpose trust or a person trust before deciding whether the purpose trust law applies. The rule against perpetuities that limits other types of trusts in the Cayman Islands to the statutory perpetuity period of 150 years does not apply to a STAR trust and, therefore, a STAR trust can have perpetual existence. The STAR provisions stipulate that a STAR trust is not rendered void by uncertainty as to its objects or mode of execution. It allows the trust deed to give the trustee or any other person power to resolve an uncertainty as to its objects or mode of execution. The STAR provisions deal comprehensively with the issue of enforcers. They provide that the only persons who have standing to enforce a STAR trust are such persons, whether or not beneficiaries, as are appointed to be enforcers by the terms of the trust deed, or in certain circumstances by order of the court. Therefore, beneficiaries who are not enforcers have no right to enforce the trust or to obtain information regarding the trust. The Foundation Companies Law, 2017 introduced a new vehicle to the Cayman Islands that can be used for a wide variety of applications including private, commercial or philanthropic purposes. The foundation company employs the well-known advantages of a company but has greater flexibility over the objects, management and supervision to enable it to be tailor-made to the founder's objectives. 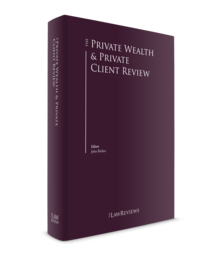 This vehicle is especially attractive to those clients in civil law jurisdictions who are considering a wealth planning structure as the instrument feels like a company while retaining the adaptability of a trust. appoint a qualified person as secretary of the foundation company. The foundation company is a legal person and thus any uncertainty over the validity of a structure are negated where this vehicle is used for wealth planning. Another significant comfort to potential founders is that the 'firewall provisions' ingrained in the Cayman Islands Trust Law will also apply generally to assets contributed to foundation companies. a restricted trust licence is issued subject to the condition that the trust business is limited to certain named clients. A restricted licence trust company is restricted to acting as trustee to specific named trusts that are for related parties or a specific group. All directors and senior officers (including any changes after licensing) must be approved by CIMA. The Cayman Islands has been a leading jurisdiction for the creation of registered private trust companies (PTCs). A PTC is generally established by a wealthy family to act as trustee of specific family trusts. It allows stakeholders to retain a level of influence over their family trusts as they can have input into the choice of the directors of the PTC or potentially to serve as directors themselves. The PTC may also allow greater flexibility when it comes to the choice of investment strategy and advisers, or generally to fulfil the trustee role in a different way to a fully licensed trust company because it has a more focused mandate and risk profile. Often, a PTC is run in conjunction with a family office or with a specific group of trusted advisers that have a legacy connectivity and familiarity with the family. The Private Trust Company Regulations (the Regulations) introduced in 2008 allow a trust company that is incorporated in the Cayman Islands and that conducts no trust business other than connected trust business to register as a registered PTC. Connected trust business is defined as trust business in respect of trusts, the contributors of which are all, in relation to each other, connected persons. The effect is that PTCs set up to act as trustees of specific family trusts can be exempt from licensing. Where a PTC chooses not to be licensed and to rely on the exemption allowed by the Regulations, it must register with CIMA by paying an initial registration fee and by filing an annual declaration. The Confidential Information Disclosure Law 2016 came into force in July 2016 with the repeal of its predecessor, the Confidential Relationships (Preservation) Law (2009 Revision) (CRPL). The new Confidential Information Disclosure Law revises the Cayman Islands' approach to confidential information to be in line with the UK and most common-law jurisdictions. The criminal penalties that accompanied the old CRPL have been removed, but importantly, it retains the mechanism for seeking court approval for certain disclosures, which ensures that the rights to privacy of information remain well protected. The new Confidential Information Disclosure Law also preserves many of the previous statutory exemptions through which disclosure of confidential information was permitted, including with prior consent or in the normal course of business. Notably, the new Confidential Information Disclosure Law also introduces a whistle-blower defence for disclosures made in good faith in certain scenarios. Overall, the Law is a more user-friendly piece of legislation that continues to protect privacy and the unwarranted publication of confidential information, while allowing compliance at the global level with adequately substantiated information requests. personal data shall not be transferred abroad unless the country or territory to which it is transferred ensures an adequate level of protection for the rights and freedoms of data subjects in relation to the processing of personal data. It is noted that the Data Protection Law 2017 contains a number of exemptions that may apply, including in relation to trusts, which ensure the integrity of the trust structure is maintained against prejudiced claims. The Cayman Islands recognises that the vulnerability of entities operating in international financial centres, such as the Cayman Islands, has been heightened, as have the consequences of security breaches. Given the heightened risks, CIMA has reviewed and strengthened its own security strategy. Along with central government and the Information and Communication Technology Authority, CIMA has taken the decision to adopt the National Institute of Standards and Technology Cybersecurity Framework, which is a risk-based set of guidelines designed to help organisations assess current capabilities and create a prioritised roadmap towards improved cybersecurity practices. Going forward, CIMA will review the approach of licensed trust companies to data security risk management. Depending on the trust company's business and risk profile, they will examine one or more of the following areas: technical controls, incident response and staff training. As part of the reviews, CIMA will also consider the trust company's ability to protect the confidentiality, integrity and availability of sensitive customer and other information. As a leading international financial centre, the Cayman Islands has framed its regulatory system around international standards of supervision and cooperation with overseas regulatory authorities. Professionals working in the financial services industry in the Cayman Islands must abide by the Proceeds of Crime Law, as supplemented by the Money Laundering Regulations and Guidance notes. The Cayman Islands has accepted the Financial Action Task Force's (FATF) Forty Recommendations on the Prevention of Money Laundering and Nine Special Recommendations on Countering Terrorist Financing, which are the international standards for effective anti-money laundering and counter-terrorist financing regimes. The Cayman Islands is a member of the Caribbean Financial Action Task Force (CFATF) and observes the CFATF's 1992 Kingston Declaration on money laundering. This declaration endorsed the implementation of the 1988 United Nations Vienna Convention, the Organisation of American States Model Regulations, the FATF's Forty Recommendations and the 19 Regional Specific Objectives. The Cayman Islands commenced new laws on 1 July 2017 that introduced enhancements to its existing beneficial ownership regime. The new legislation requires certain companies incorporated under the Cayman Islands Companies Law to maintain a register of beneficial ownership at the registered office of the relevant company. This information will be uploaded to a non-public, secure centralised platform maintained by the government. In general, the register must contain the names and details of all individuals and certain relevant legal corporate entities holding (directly or indirectly) more than 25 per cent of the shares or voting rights in the company or the right to appoint or remove a majority of the company's board of directors. holding directly a legal or beneficial interest in the shares of a legal entity that holds a licence under the Banks and Trust Companies Law (2018 Revision), the Companies Management Law (2018 Revision), the Insurance Law (2010 Revision), Part III of the Mutual Funds Law (2015 Revision) or the Securities Investment Business Law (2015 Revision). The Cayman Islands signed a Model 1B (i.e., non-reciprocal) intergovernmental agreement with the United States to implement the US Foreign Account Tax Compliance Act (FATCA). The jurisdiction has also signed an intergovernmental agreement with the United Kingdom to implement UK FATCA, which will be phased out and replaced by the CRS. The jurisdiction is an 'early adopter' of the CRS, having agreed to the exchange of financial account information with the first group of participating jurisdictions by September 2017. The Department for International Tax Cooperation (DITC) in the Cayman Islands has issued guidance notes for FATCA and CRS and all reporting under the regimes will be directly submitted to the DITC in the Cayman Islands. The Cayman Islands introduced country-by-country reporting (CbCR) legislation in 2017 as part of its commitment to comply with Action 13 of the OECD/G20 Action Plan on Base Erosion and Profit Shifting (BEPS). CbCR requires multinational enterprises that meet certain criteria to file a report with tax authorities. The reports provide a breakdown of the amount of revenue, profits, taxes and other indicators of economic activities for each tax jurisdiction in which the multinational enterprise group does business. This legislation only applies to multinational enterprise groups with an annual consolidated group revenue of at least US$850 million in the preceding fiscal year. The Tax Information Authority (International Tax Compliance (Country-by-Country Reporting) Regulations 2017 require reporting entities resident in the Cayman Islands to collect, maintain and report information for exchange with partner jurisdictions and impose a notification obligation on certain relevant entities resident in the Cayman Islands. The Cayman Islands is cognisant of the fact the jurisdiction's thriving trust industry exists as part of a global economy. Therefore, every effort is made to increase international cooperation and collaboration, without compromising proper rights to confidentiality of its users to ensure compliance with financial services best practice. As with other sectors, trust legislation in the Cayman Islands continuously evolves to meet the ever-changing needs of the financial and private client industry, as well as to adapt to the need for effective compliance at the highest global standard. At present, there is proposed legislation for further amendments to the Trust Law legislation. We also expect revised regulations on private trust companies, which will further increase the attractiveness of the Cayman Islands for the establishment of private trust companies. Recently, there has been continued dialogue regarding the transparency of beneficial ownership in all jurisdictions. The government has been proactive in this regard, and continues to liaise with appropriate officials, to ensure its solution maintains the confidentiality and security of client data for private entities by ensuring the platform is offline and not open to the public at large, while ensuring proper authorities conducting legitimate investigations can obtain relevant information on a timely basis. While historically the creation of trusts offshore was often driven by efficient tax planning, for the current generation this has changed. Tax considerations continue to be a factor; however, the focus is now on planning for the wealth succession for future generations of the family and protection of assets from improper external threats. The Cayman Islands provides a tax-neutral, stable, sophisticated environment for such planning. Looking forward, local substance of services and potentially family office presence in the relevant jurisdiction may become ever more important. There is proposed family office legislation in the pipeline that will ensure family offices can establish a substantive presence in the Cayman Islands efficiently. The Cayman Islands boast world-class living accommodation, restaurants, schools, political stability and a legal framework that is attractive to families considering establishing a presence in the jurisdiction. The expert service providers in the Cayman Islands can assist stakeholders with an efficient and effective strategy to establish or move structures to the jurisdiction. 1 Alan Milgate is a partner at Rawlinson & Hunter.